copy to multiple drawings manually is taking time and efforts from users,Imagine you have 100 drawings that mean you will open all files one by one and paste to orignal coordinate this procedure is very hard , so how make copy to multiple drawings in easy way. You can make copy to multiple drawings without opening by using autocad lisp and it is powerful , let us know first the summary of this autolisp. This program enables the user to copy a selection of objects to a selected set of drawings, without opening the drawings in the AutoCAD Editor. Prompt the operator to make a selection of objects residing in the active drawing layout that are to be copied. 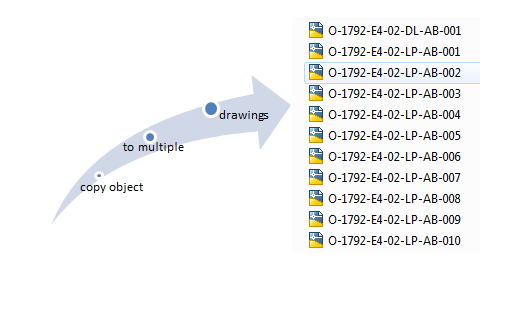 Following a valid selection, the user will be prompted via a dialog interface to compile a list of drawings (dwg/dwt/dws) to which the selected objects will be copied. This routine lisp will proceed to copy every object in the selection to each selected drawing using an Object DBX interface. All information associated with each copied object, including the position, scale, rotation, etc. Properties such as layers & linetypes will be imported if not already present in the external drawing. Similarly, the drawing layout in which the source objects reside will be created if not already present in the external drawing. 1- Upload lisp (see how to upload the lisp in cad file). 2-Type in command line C2DWG. 4-Select objects and hit enter key. 5-See the video below for remaining.